Learn yoga for back pain in this three-part course. Improve the overall health of your spine with this comprehensive Iyengar Yoga resource. You will be guided through three complementary yoga sequences for back pain. 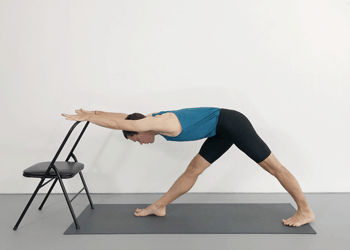 Each sequence demonstrates unique ways in which you can use Iyengar Yoga to improve spinal balance, mobility and strength. Please seek permission from your doctor prior to commencing this course. This course will guide you step-by-step through three unique Iyengar yoga sequences for relieving back pain. You will cover a range of poses and variations that will equip you with a method for fostering balance, mobility and strength in your spine. With regular practice, you will start to feel some relief from back aches and pains. As your spine gains mobility and strength, your posture will improve. You will start to notice greater capacity in other yoga poses. The learning from this course can be supplemented by two related Yoga Selection blog articles. Each article takes you through a back pain sequence and has accompanying images and instructions.